What's better than new gear? Winning new gear...before it's even released. This summer, Mountainsmith is excited to introduce women's trekking poles and lumbar packs to our growing women's specific collection. But first, we'll be giving away your choice of trekking poles + packs in the p̶r̶e̶-̶r̶e̶l̶e̶a̶s̶e̶ She-Release #SheAdventures Giveaway. While in the Official Rules it says “The number of times you can enter the Giveaway will be posted on the applicable Giveaway site”, nowhere on here is that indicated. Hi Gary, we advise that each person only enter with their primary e-mail address. Thanks for asking! Thanks for the opportunity to win. Pick me please. I love hiking and backpacking. Hope I win , climbing Kilimanjaro and training for my first big adventure! What an awesome adventure. Best of luck! For sure! We’re excited to keep introducing more and more women’s specific gear (with all of the same quality as the men’s). As a woman in the outdoor industry, I share your and your daughter’s excitement. Thanks for entering! Thank you Mountainsmith for ladys-only giveaway opportunity. 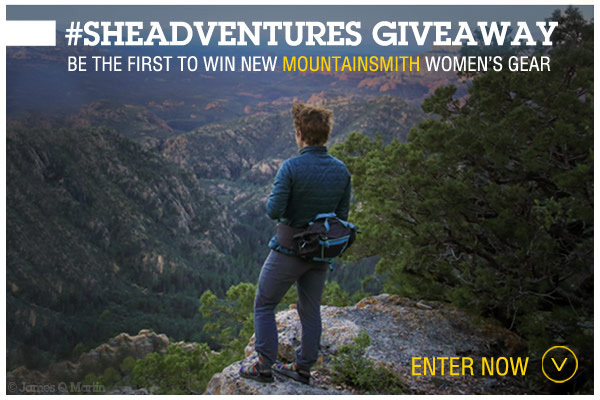 As an ‘older’ lady hiker, I welcome the opportunity to win a new, better piece of equipment/gear. Sure thing! Keep an eye out for more and more women’s specific equipment over the next few months. Getting my girl friend into backpacking, hoping for a giveaway win to assist with gear. Awesome, always good to spread the backpacking love! Best of luck.